Long and strong hip abductors are key for proper alignment in all you do. Learn how to build them and support your entire kinetic chain with 3 hip abductor stretches. You’ve got 3 major hip abductors – your gluteus minimus, your gluteus medius, and your tensor fasciae latae (TFL). Your gluteus minimus is the deepest and smallest of your glute muscles. It runs from your ilium (your big “hip bone” on your pelvis) to the top of your femur . Your gluteus medius lies on top of this muscle and is a bit bigger. It also runs from your ilium to your femur, but it is a broader muscle and covers more surface area . Your gluteus medius is your MAIN hip abductor. But this muscle also helps in hip extension, which will be important to remember when it comes time to stretch it out. Your tensor fasciae latae is longer located more laterally – it runs down the side of your hip and thigh. This muscle originates on the lateral edge of your ilium and runs with a band of tissue called the iliotibial (IT) band all the way to the tibia, below the knee. These 3 muscles share the common function of hip abduction, which means they work to take your leg out laterally, away from the midline of your body. There’s more to this hip abduction role than you might think. Sure, you can hit the abductors on the abductor machine at the gym. Other common hip abductor exercises are the clamshell and side-lying hip abduction – think Jane Fonda in Buns of Steel! But these muscle’s functions also translate to a wide variety of uses in sports and in everyday life. If you’re throwing martial arts sidekicks or striding out to the side while ice skating or rollerblading, you’re depending heavily on the hip abductors. And these muscles also serve to aid you in single-leg stance balance and general pelvic stabilization while walking or running. 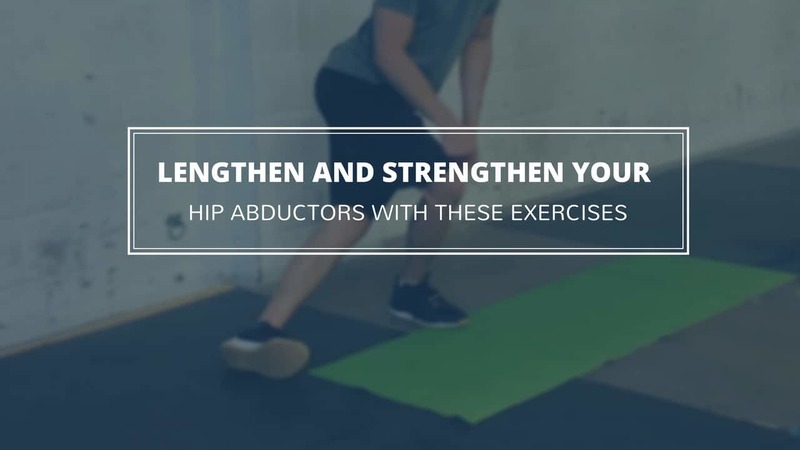 So whether you’re getting dressed and hopping around on one foot to pull on your pants or throwing a kick, your hip abductors are working to keep you balanced on one leg. And when you walk or run there’s one foot off the ground so your hip abductors are working to stabilize the pelvis so that your hips don’t swing or sag wildly as you move around. What Are Some Common Hip Abductor Problems? If these muscles are either tight and overactive or weak and lazy to activate, problems can occur. Dysfunction of the hip abductor can lead to lateral pelvic shift. Let’s say your abductors aren’t functioning as they should as balance on one leg – your pelvis won’t stabilize properly and you’re going to experiencing a shifting of your hips to the side. This lateral shift can be a more subtle sign, but these issues can also cause something called the Trendelenburg sign – a significant marker for issues with pelvic stabilization and hip abductor dysfunction . To test this quickly, stand in front of a mirror. Come to standing on one leg, and watch your hips. If your pelvis either drops down, or your hips shift out to the side, you’ve probably got issues with your hip abductor muscles. These pelvic shifts, hip drops, or other postural issues due to weakness or dysfunction of these hip abductors can cause problems further down the chain. One extremely common issue is patellar pain, causing symptoms felt at the knee. Poor lower limb alignment stemming from the hip abductors can place a large amount of pressure, force, and pain upon the knee. Unfortunately, this is especially true if you are an athlete who is repeatedly running or jumping in a compromised position. How Do You Stretch the Hip Abductors? In the face of hip abduction dysfunction and tightness, you might drop into one static stretch that is the old-stand by for these muscles – the side bend against the wall. But these traditional hip abductor stretches don’t really do much to consider the whole complicated picture of hip abductor function, and they definitely don’t address the issue of strength. Plus, if you are tighter in your quadratus lumborum or your lateral torso muscles, there’s a chance that this stretch will won’t even hit your hip abductors. So instead of this less than ideal approach, I recommend a complete hip abductor workout that tackles both flexibility and strength in just 3 moves. This technique is a good, far-reaching static stretch that hits many areas. Remember that your gluteus medius also aids in hip extension. So to lengthen it fully, we’ve got to go into hip flexion and hip adduction. We’ll end up with a hip abductor stretch that also stretches the rectus femoris of your quadriceps and encourages elongation of the spine – not too shabby for one move, huh? While the first move focused on range of motion, this next drill will work on increasing range of control – or strength throughout the range of your hip abductors. This isometric technique does serious double-duty because it simultaneously works on building your open chain AND your closed chain strength. The muscles of the bottom leg (the closed chain portion) will be working on the stabilization function of the hip abductors while the muscles of the top leg (the open chain portion) become highly activated and move through the full abduction movement pattern. This last technique also combines open and closed chain movements, but it really takes things to the next level. This move will help you integrate the strength of these muscles into a functional, multi-joint movement pattern. The closed chain side is being strengthened, the open chain side is being actively lengthened, all while you train a dynamic movement pattern that can translate easily into performance gains. These 3 hip abductor stretches represent a multi-dimensional approach to working the hip muscles. You’ll work your hip abductors at all ranges (lengthened and shortened) and with varied functions (open versus closed and isometric versus dynamic). By choosing hip abductor stretches and exercises that address the varied ways the muscles actually function in your body, we end up with a complete hip abductor workout that addresses both flexibility and strength. Whether you’ve got a Trendelenburg sign and lateral pelvic shift, you want better balance and power when you throw a kick, OR you just want to walk around comfortably and with proper alignment, use these hip abductor techniques.